I’ve been learning Magic: The Gathering casually with friends and via the Arena closed and open betas for a few months. Last weekend I attended my first pre-release event (the Guilds of Ravnica); it wasn’t ideal for how I play Magic, but I was rewarded with a few pleasant surprises and a fun experience. Starting with the (lone) negative, the $25 entry fee (it varies by location) is high for me. It’s great for Standard Magic players; the cards received and new-set experience can be very valuable. I play infrequently with friends, and in a format closer to Modern (I’m attempting to fix my deck for Pauper, just to give myself some direction). The cards aren’t useful to me, so I paid for the experience. My three positive takeaways far outweigh the negatives. First, I loved the pre-release setup. As a noob I loved getting a new die and a nice guild box, full of fresh packs to open (literally everyone’s favorite part of any card-collecting). I prefer sealed to draft, and was grateful for being able to research guilds ahead of time; both contributed to a more relaxing deck-building experience. Second, I fared surprisingly well (3-1) thanks to good luck and great advice. An experienced friend recommended a red/white Boros deck of low-drop, relatively strong creatures. 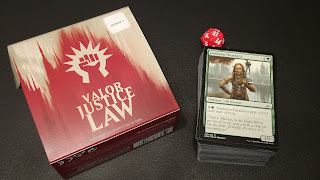 It was perfect for speedier sealed play, and I drew several great red/white creatures including some versatile Fresh-Faced Recruits, a massive Swathcutter Giant and a wildly useful Aurelia, Exemplar of Justice. The last card brings me to my last point, which is that my pre-release card – a holo Aurelia, Exemplar of Justice stamped with the date – was the best, most interesting and valuable card I pulled. I could’ve had a worse pre-release card and no Aurelia at all; the experience would have been less successful and memorable. I may trade the rest of my pulls to help fill my Pauper deck, but Aurelia I’ll display with pride on my nerd shelf, right next to the Beelze that made my Yugioh deck nearly passable. Thanks for the good time, Aurelia.